After selecting Elena Delle Donne with the second pick in the 2013 WNBA Draft, the Sky made the playoffs for four straight seasons, including their first Finals appearance in 2014. With Delle Donne traded to Washington during the offseason, the Sky enter a new era as they open their 12th WNBA season. We got a glimpse of the Sky without Delle Donne during last year’s playoffs after thumb surgery late in the regular season kept Chicago’s leading scorer on the sidelines. 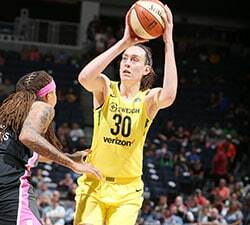 The Sky won a pair of playoff games – a second round win over Atlanta and took one game from the eventual champion Sparks in the best-of-five Semifinals – without the 2015 MVP. While replacing Delle Donne’s combination of scoring (21.5 ppg, 2nd in WNBA), rebounding (7.0, 11th) and blocks (1.54, 5th) is not easy, the Sky showed that they could compete without her. In exchange for Delle Donne, the Sky received center Stefanie Dolson, wing Kahleah Copper and the No. 2 pick in the 2017 Draft, which they used to select Alaina Coates from South Carolina. Dolson and Copper will be able to help the squad right away, but the Sky will have to wait for their highly-touted rookie as Coates underwent surgery on her ankle, which forced her to miss South Carolina’s run to the NCAA title this year. How soon she can return and how quickly she can contribute will go a long way to evaluating the Delle Donne trade. Coates isn’t the only rookie that will make an impact for the Sky – so too will new head coach Amber Stocks, who replaces Pokey Chatman after she led the Sky for the past six seasons. 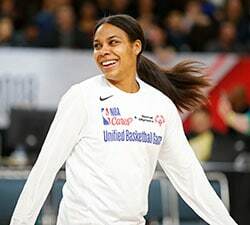 While Stocks is a first-time head coach, she brings a wealth of experience from her time as a college and WNBA assistant coach, most recently for the 2016 WNBA champion Los Angeles Sparks. In addition to head coaching duties, Stocks also serves as the team’s general manager, allowing her to put together a roster that fits her favored style of play. 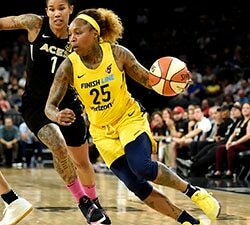 While the Sky have plenty of new faces to incorporate, they do return a veteran core from last year’s team, including guards Courtney Vandersloot and Cappie Pondexter, forwards Tamera Young and Jessica Breland and second-year center Imani Boyette, who earn All-Rookie Team honors. The 6-7 Boyette ranked seventh in blocks (1.35) and 17th in rebounds (5.6) despite averaging just 18.9 minutes per game. With a new coach calling the shots and new players to add into the roster mix, what kind of team will Chicago be this season? A year ago, the Sky played uptempo (79.6 pace), had the second-best offense (107.0 OffRtg) and second-worst defense (106.1 DefRtg). Will they continue to play fast and try to outscore opponents on a nightly basis? Will Stocks try to slow things down and become a more defensive-minded team? We’ll get our first look at the 2017 Sky this week with a pair of preseason games against Connecticut (May 2) and New York (May 3). 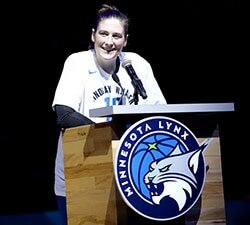 Those games will help Stocks finalize her roster as the team prepares to open the season on May 14 against a formidable opponent – the Minnesota Lynx, who finished with the top record in the league last season.